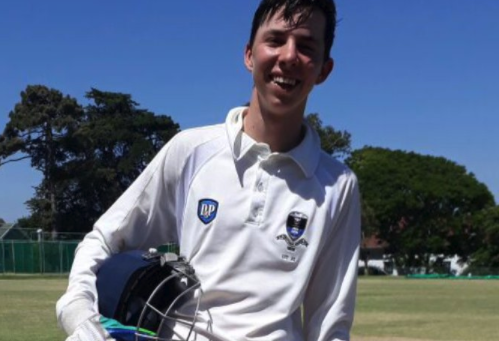 Grade 10 SACS pupil Daniel Smith has made three centuries and two half-centuries in his first five matches for the 1st XI this season. The 15-year-old scored all of his runs at the recent Cape Cricket Festival, which was jointly hosted by Wynberg Boys’, Paarl Boys’ and SACS. Smith carried his form over from last year when he represented SACS U15A and Western Province U15. Smith scored 101 not out, 100, 53 not out, 126 not out and 53 not out against tough opposition in Noord-Kaap, Waterkloof, Northcliff, Garsfontein and St John’s respectively. Smith did not give too many secrets away when asked about the key to his current form. However, he said he works extremely hard on his game and puts in lots of extra hours while he also acknowledged the help he has received from influential coaches at school and Western Province. Smith is hoping to be selected for the WP U17s this year. While he also played U15A rugby last year and enjoys the sport, his big dream is to become a professional cricketer. The opening batsman says his sporting hero is Quinton de Kock, as he too is a wicketkeeper-batsman. If Smith maintains his current form, he could soon follow in De Kock’s footsteps.